Tash Wong made a very fresh and enthusiastic presentation where she talked about how our personal perspectives may be limiting our work and hindering our teams. “We have a hard time talking about our perspectives and priorities.” and this is vital to be on the same page at a project. 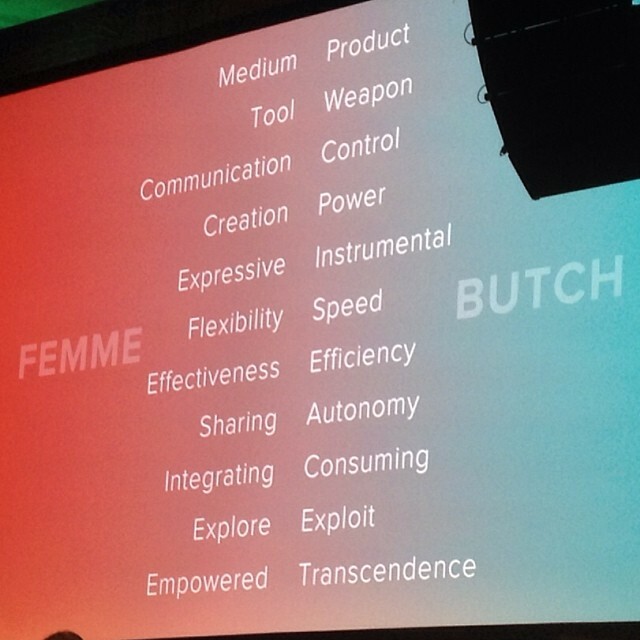 She identified several characteristics for projects and it’s counterparts separating them in two groups differentiating between the femme and butch thinkers. To promote articulate a better conversation she created THINK BIGGER, MAKE BETTER cards, a conversational framework to uncover new ideas, better empathize with others and build stronger relationships between teams at work.